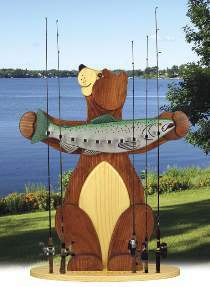 This bear is proud to display his catch of the day - a fishing rod holder like no other! Everyone who sees it will love it. Holds up to 10 rods. Make it from 3/4" and 1-1/2" stock. Pattern drawn FULL SIZE. Measures 53-1/2"H x 42-1/2" W. Order plastic eyes separately below.